SAN FRANCISCO — With three missions launched in 2014 and two scheduled to fly in January 2015, NASA is making significant progress reinvigorating its fleet of Earth observation satellites and space-based instruments, said Michael Freilich, NASA Earth Science Division director. When Freilich took that job in 2006, the division’s fleet was composed primarily of spacecraft that had exceeded their anticipated lifespan. While many of those aging satellites remain aloft, they gradually are being replaced and augmented by new free-flying spacecraft and Earth observation instruments mounted to the exterior of the international space station. 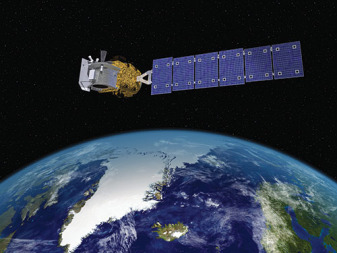 Although the division does not intend to continue launching at its current pace, it plans to send aloft as many as 13 missions during the next seven years, including the Pre-Aerosol Clouds and ocean Ecosystem (PACE), a mission designed to help researchers monitor ocean color and other indicators of global climate change. “We have gotten permission from NASA headquarters to initiate PACE as a directed mission to Goddard [Space Flight Center],” Freilich said. In addition, NASA’s Earth Science Division plans to launch in 2016 the Stratospheric Aerosol and Gas Experiment (SAGE)-3, an ozone-monitoring instrument, and Cyclone Global Navigation Satellite System (CYGNSS), an Earth Venture-class mission designed to measure GPS signals reflected from the sea surface to examine the evolution of winds in tropical cyclones. Sometime in mid-2016, NASA plans to send the SAGE-3 instrument to the space station aboard SpaceX’s Falcon 9 rocket and Dragon capsule. In October 2016, NASA is scheduled to launch the eight small satellites of the CYGNSS constellation on an Orbital Sciences Pegasus rocket. In 2017, NASA plans to launch the follow-on to the Gravity Recovery and Climate Experiment mission. The joint mission involving the United States, the German Research Centre for Geosciences and DLR, the German Aerospace Center, is designed to map Earth’s gravity field. NASA is scheduled to launch in 2018 the Ice Cloud and Land Elevation Satellite-2 mission as well as Tropospheric Emissions: Monitoring of Pollution, or TEMPO. TEMPO, an instrument being built by the Smithsonian Astrophysical Observatory and Ball Aerospace & Technologies Corp., is designed to operate as a hosted payload on a commercial geostationary satellite. a successor to the Landsat 8 medium-resolution Earth Observation satellite. That frenetic pace is the most that NASA’s Science Mission Directorate can handle, Freilich said. “We are basically at a point where we can’t support any more solicitations for orbital-type missions at a cadence higher than what we have now without substantially changing the staff of the agency in order to do more reviews,” he explained. 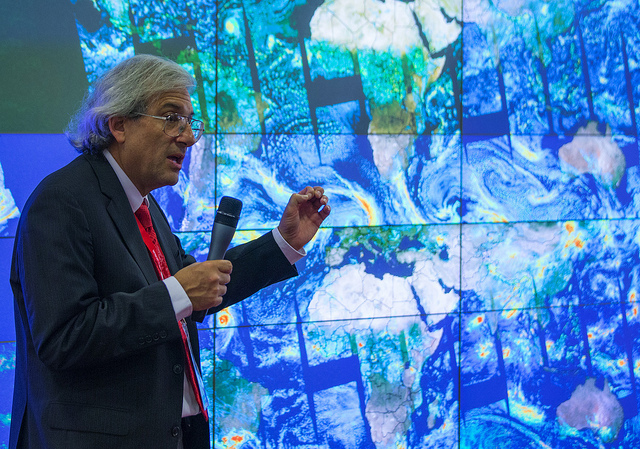 Freilich also briefed scientists on Landsat 9. In language included with the recently passed 2015 budget, Congress directed NASA to develop a Landsat 8 follow-on but to halt efforts to identify alternatives to the single-satellite architecture that the space agency has relied on since the first in the series of moderate resolution Earth imaging spacecraft was launched in 1972. Those efforts stemmed from previous spending bills in which Congress urged the space agency to find less expensive ways to collect the data. A 2014 spending bill directed the space agency to develop a Landsat 9 project that would provide the same data resolution and frequency as the existing satellite at a cost of $650 million or less. That cost cap was removed in the 2015 spending bill, but Congress is continuing to press NASA to make sure Landsat 9 is less expensive than Landsat 8, a joint NASA-U.S. Geological Survey project that cost about $850 million to build and launch in February 2013. “The agreement does not endorse any efforts to develop alternative approaches to this data acquisition that would increase the risk of a data gap,” according to the 2015 spending bill. Landsat 8 and the three Earth Science missions launched in 2014 are operating well and providing high-quality data that is improving research and forecasting, Freilich said. The U.S. Naval Research Laboratory, for example, is using sensors flying on the Global Precipitation Measurement mission core observatory, a joint NASA-Japan Aerospace Exploration Agency mission launched in February, to improve its ability to forecast tropical cyclones. Similarly, Rapid Scatterometer, an instrument sent to the space station in September in the cargo trunk of the Space Exploration Technologies Falcon 9 rocket, proved its utility in early December by measuring the wind speed and direction during Super Typhoon Hagupit.